Why aren't we better at asking for help? Several years ago, I had a burning desire to write a book about the experience of women in business. I had a sneaking suspicion that no one was really telling the truth about what this was really like and I wanted to blow the cover on the smug assumption that everything in the garden was rosy. But no one was interested. Publishers said I wasn't famous enough -- I wasn't Jack Welch, so who would be interested? Register now for WITI's 2005 Silicon Valley Conference! Plan now to attend WITI's 2005 Silicon Valley Conference, December 8th & 9th at the Doubletree Hotel in San Jose, California! This event will feature the 10th Anniversary Gala for the WITI Hall of Fame. For more information and to register now, please visit www.witi.com/sv/. As I watched the televised devastation caused by Hurricane Katrina, I felt compelled to do my small part in assisting those in need. To make use of my expertise in employment, I traveled to Houston to help people who relocated from New Orleans to find jobs. On Labor Day I walked into the Astrodome with a handmade sign that read, "Are you looking for a job?" I was soon surrounded by people who shared their stories of struggle. They had lost everything: their homes, possessions, jobs, and in some cases, contact with family and friends. These were cashiers, housekeepers, laborers, drivers, prep cooks, dishwashers, and janitors all of whom were eager to get back to work. We at WITI are shocked and saddened by the devastation wrought earlier this month by Hurricane Katrina and the aftermath, and now by Hurricane Rita. We have been contacted by a number of our members who have been affected by these disasters. We have also heard from other members who would like to support those who need assistance. In response, we have set aside an area on our discussion boards. If you are one of those affected by the hurricanes, please let the WITI community know if there is anything we can do to help you. If you have resources to offer, please take a moment to visit the discussion boards to see how you can be of assistance. The human devastation from Hurricane Katrina has touched our hearts in the US and around the globe. You may not have been directly impacted, but you may have been touched, perhaps through sharing your time or your money to help evacuees. I was in the hospital for surgery during the aftermath of Katrina and contemplated the plight of the many in hospitals during this tragedy. Surgery and recovery are difficult enough under the best circumstances, but with no power, no water, windows blown from buildings, and waters rising rapidly, even basic medical needs are difficult to meet. You think of how much more difficult recovery would be being hauled out on a gurney through floodwaters. WITI is upgrading our technology infrastructure to support our recent growth. In order to do this, we need new, high-end servers, and we are looking for a company interested in partnering with WITI to provide servers in exchange for WITI branding, sponsorship, products, services, etc. For more information about partnering with WITI, please visit www.witi.com/corporate/. For specific information on WITI's needs at this time, please contact us. Susan O'Neil, author and businesswoman, participated in the Get Found! Conference on September 8th in Rocky Hill, CT. The conference is the largest conference on search engine marketing in New England, and Ms. O'Neil hosted the panel on Paid Search Marketing. According to recent studies, more than 85% of people looking for products or services on-line begin at the major search engines and directories, such as Google and Yahoo! However, because these search portals list millions of web pages within their databases, it is important that a Web site get listed in the top of the search engine rankings in order for it to be found by Web surfers. The panel on Paid Search Marketing, Creating Compelling Ads & Landing Pages, discussed proven strategies for achieving the highest ROI in Pay-for-Placement search marketing. Panelists included Emily Merkle, MIVA; Doug Kneeland, Adams & Wright; and Karen Hudgins, Sane Solutions. Ms. O'Neil is the founder and CEO of @Web Site Publicity, Inc. of Peterborough NH, a marketing services firm specializing in search engine optimization and online public relations. The firm serves clients ranging in size from small business to major brands. A volunteer editor for the Open Directory Project, Ms. O'Neil presents and writes frequently on web marketing and is the co-author of Maximize Web Site Traffic. Auditel is committed to providing the best telecommunications audit and telecommunications training available anywhere. Auditel telecom bill reduction is completed without the need for carrier changes. Our telecommunication audit services include telecom contract analysis, telephone line inventory, telephone bill consolidation, and telecom cost management analysis. 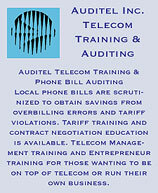 Auditel telecommunication training is not a seminar. We offer many hands-on telecom training workshops; from one day to 10 day trainings available. Auditel is now offering disaster training and planning. If the unexpected strikes your business, will your customers still be able to find you? Let Auditel review your bills, identify the lines your customers call and those important internal lines for inter-company connections and develop a response that will help prevent you losing customers just when you've lost everything else. Mention WITI when you call us and save 5% on trainings or disaster planning through December 30, 2005. The second annual Women's Game Conference (WGC) is just over 1 month away, taking place October 26-27, 2005 in Austin, Texas. Early-bird registration ends September 30th. Early Registration - only $145 for game industry professionals - and more information can be accessed by logging on to http://www.womensgameconference.com. WGC focuses on women in the computer and video game industry and highlights the importance of women as consumers of games, draws attention to the contributions women bring to the game industry workforce, and creates an environment conducive to networking. Kris Soumas, Vice President of Interactive for Lifetime Entertainment Services will deliver the keynote address at WGC. Early registration (before September 30th) is $145. After September 30th the registration rate rises to $165 and onsite registration is $195. Early registration for students prior to September 30th is $95. After September 30th the price for students is $115 and onsite registration is $145. Student scholarships are available; see http://www.womensgameconference.com/scholarships.html for details. WITI Members: Visit the discounts page in the Members Area for the promo code worth a 10% discount.